The Roter Bär Pit in Sankt Andreasberg in the Upper Harz is an iron ore mine that was worked from about 1800 until the 1860s. Today it is operated as a show mine under the name of Roter Bär Pit Educational Mine by the Sankt Andreasberg Society for History and Archaeology. The name Roter Bär means "Red Bear". In line with historical practice the funds required to restore the historic mine were raised through the formation of a mining trades union and issue of share certificates. The former iron ore mine situated in the Bären valley at the foot of the Knöchel, east of Sankt Andreasberg forms the heart of the educational Roter Bär Pit today. The mining of brown iron ore, which occurs here as lens-shaped inclusions in a Middle Devonian shale-limestone series, began around 1800 and ended in the mid-1860s. The pit, which was operated by private individuals (Eigenlehnern), produced about 50-60 tons of ironstone annually with a workforce of just 4-6 men. The very soft, often clayey, ore was won using picks (Keilhauen) without the need for drilling and blasting. Simple hand picking enabled it to be enriched by up to 35-40% Fe content. Its only customer was the Hanoverian state's Königshütte smelting works in Lauterberg. 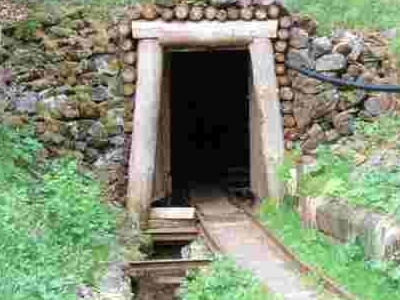 In 1931 the newly-founded Sankt Andreasberg Society for History and Archaeology took the pit over and established the first visitor mine in the Harz. After 10 years guided tours came to a standstill due to the Second World War. The site, which now acted as an air-raid shelter, saved the lives of many people who fled here during the fighting in April 1945. Here's the our members favorite photos of "Mines near Goslar". Upload your photo of Roter Bär Pit!